I love Spring! It’s the time of rejuvenating, refreshing, and… reintroducing. I’d like to take this opportunity to say hello to all the new readers who have joined the Sweet Romance Reads group over the past few months. Here I am—years later—with forty or so novels under my belt. It seems unimaginable to me, but my sweet romance stories have earned three HOLT Medallions as well as other awards. Four million copies of my books have sold worldwide and I've even made the USA Today Bestsellers List. I feel utterly and joyously privileged that readers continue to enjoy my books. 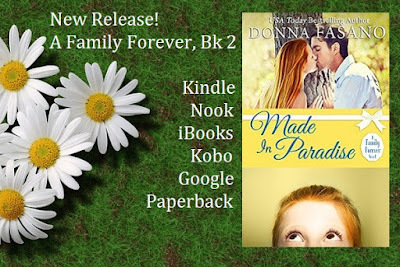 I hope you’ll take a look at my newest sweet romance—MADE IN PARADISE. It’s the second book in my A Family Forever Series. The book is available in ebook format for Kindle, Nook, Kobo, iBooks, and Google. Coming soon in paperback! Fabulous, Donna. Best wishes for your continued success. I'm waiting for paperback. Thanks for the heads up. Judy, the paperback should be available very soon. Donna, congrats on all your accomplishments. 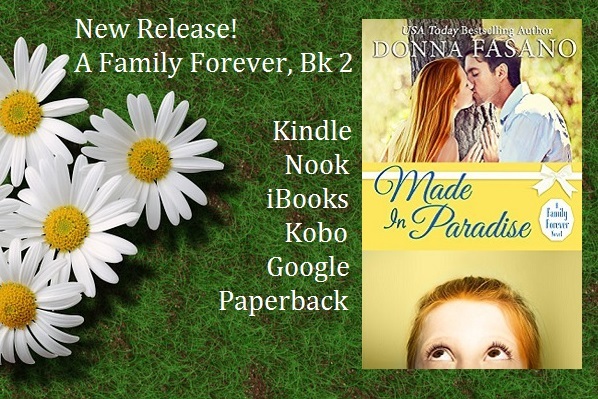 I love the cover for Made In Paradise. Hi Donna! I also started writing when my kids started school. So glad you did! Congratulations! Another book to add to my TBR list.